Solar Panel Efficiency indicates the ratio between output solar power and incident Sun light energy on that Solar Panel. Multiplied by 100 with this ratio, we get the Solar Panel Efficiency in percentage. Scientist already developed 40% efficient solar panel in laboratory. But in practical life we get 16-18% efficiency in quality Solar Panel. 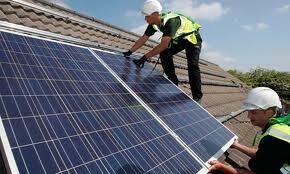 That means, the solar panel convert the solar energy into electricity 16 to 18% of incident solar power on its. The more higher the efficiency, the lower the size of solar panel required. So the efficient solar panel means it requires less space in mounting area. Each Solar Panel consists of a number of solar cells. Solar panel efficiency also refers the efficiency of solar cell; those make the energy conversion directly from Sun power to electricity. So, the Solar cell efficiency always higher than the efficiency of solar panel. Because, when the cell composed into solar panel some protective layers are used like EVA layer, Glass layer etc. Glass layer reflects some incident sunlight from the panel and prevent some light from reaching the solar cells. Solar Panel Efficiency varies depending on the temperature, mounting style of the panel, internal construction of the panel, shading, positioning, installation and earthing, material used in the solar cell, aging of the solar panel and weather. Higher temperature decreases the internal resistance of the panel, so voltage drops due to increase in short circuit current. Panel should be mountain in the higher level from the surface. This can be roof top or pole mounted so that it can get higher irradiance. Manufacturers use several techniques to increase the efficiency of the solar panel like using thin and effective glass layer, Backsheet to prevent emission from the bottom side, building close connection among cells etc. As this is solar panel, naturally it should be placed in open area where irradiance available. Low irradiance or Shading is the hindrance consuming energy from sun to solar panel. Also lower irradiance is the cause of lower voltage. Perfect positioning of the solar panel increases the efficiency of solar panel much. A solar panel normally of rectangular size should be face south with an angular position (normally 23°), if we do not use solar tracking system. If we use solar tracking system, the panels then produce more power absorbing continuous higher radiation from Sun. Solar panel should be installed a few inches above from the roof having enough air flow to cool them properly. Because in hottest climate, panel being damaged due to lack of cooling. Solar panels are used with other equipments like inverter, battery, charge controller, loads and some other protective devices and cables to make a solar system. So the connection among them should be perfect, otherwise changing the connection or equipment many times may cause of damage the solar panel. Also panels should be properly earthed to protect them from lightning strike and overvoltage. There are several materials used to produce solar cells. Most commonly are: Mono-crystalline, Poly-crystalline and thin-film or amorphous. Mono-crystalline cell is of ultra pure semiconductor material, has high efficiency and long durability. It needs lower space than other and used widely. Poly-crystalline has less efficiency and requires more space than mono-crystalline. But it can absorb sun rays in different angle. Thin film or amorphous has lower efficiency and requires large area to produce same power like Mono-crystalline Solar cell. A Solar Panel got aged after many days that caused to erosion of solar panel. It occurs because of decreasing mechanical resistance, effect of ultra-violet rays and also improper using makes the aging early. So efficiency becomes lower. For the weather condition surrounded by the solar panel affected much to loose its efficiency. We need to take proper care of the solar panels due to harmful weather condition like warmest climate, rainy, snow falling, storm and regular cleaning of the solar panels. We need to clean the front of the panels by that it can absorb much radiation of Sun. Also need to clean the bottom of the panels to cool down it properly. During cloudy day solar panel produces less power than sunny day that does not means our panels are less efficient. This is because; our panel got less irradiance, so it producing less power. Loosing efficiency of a solar panel means the reduction of power produced in solar panel by day to day or per year. A Solar Panel can provide 97% performance at the first years of using. But after passing more time, it starts to loose its efficiency. Up to ten years, it can perform 90% of its efficiency. Then up to twenty five years, it can perform 80%. Solar panels loose their efficiency 0.7% per year (Mono-crystalline 0.3-0.5% per year). Solar panels also loose the efficiency if repeatedly breakdown or replacement of other parts of the solar system occurs. Solar panel has minimum 20 years durability. But it can be used up to 30 years if we take proper care when using. Higher efficiency and long life can be achieved by choosing right solar panel when buying first time, perfect installation with other required equipment and proper caring from weather.